Great topic! your thought experiment is very useful for understanding the implication of an open and decentralized ledger. It may not be for everyone, but you can imagine that some investors would favor companies that adhere to a form of radical transparency that provides real time data on not just assets, liabilities and valuations, but even internal accounting about budgets, spending, cash flow, etc. Any disadvantages from the competition knowing your books might be balanced by the reduction in middle management used for internal controls. This sort of system might first be appropriate for non-profits, who ostensibly have no competitive advantage to secrecy, but it could certainly be applied to types of companies, such as low overhead start ups. Another advantage is that an open API would exist for analyzing and processing corporate records. Any corporate services (eg. year end reporting, taxes, etc) built using these APIs could be shared and thus dramatically lower the cost of these services for companies adhering to this open architecture. Great article. You make some interesting points about cost / trust. I’ve been looking at this problem for a while and came to the conclusion that companies will never adopt a wholly decentralised ledger. Philosophically, a legal entity structure aims to centralise the operations of a business and the recording of events relating to that business, in one place. Decentralised ledgers are not inherently useful for companies to record ALL their accounting journals. As you note, they do have a place, however. As an ex-investment bank auditor, the focus of our work was on existence, completeness and valuation of transactions with counter-parties. All the other stuff comes secondary. The first hurdle is to ascertain whether or not the transaction actually exists (and is it recorded in the correct period), for widget factories this is trivial; send debtor confirmations, look for post year end cash receipts, etc. for a bank/trading house it’s far more complex, however we mostly used to rely on trade confirmations or reconciliations from clearing houses. Before we could do this, we had to rely on the operational controls of the clearing house, i.e. there is a chain of trust, which if broken, makes an auditors life a nightmare. I.e. if clearing house X fail their SOC-2 controls review and there are no compensating controls then I cannot rely on the data they produce. This happens. The bank can maintain a local ledger containing all its adjustments, however it can also maintain a list of pointers to a distributed ledger which contain details of all exchange traded and OTC derivative contracts. As the distributed ledger is agreed upon by all participants and there are, for example, digital signatures to prove some degree of non-repudiability, we can RELY on this ledger. Now the auditors job starts getting easier! Perhaps there is one huge ledger for everything, however it seems more sensible to have a ledger (or chain) for each type of thing; IRS, option agreement, insurance contract, ordinary shares, invoices. Companies just replicate the ledgers which are relevant for them. 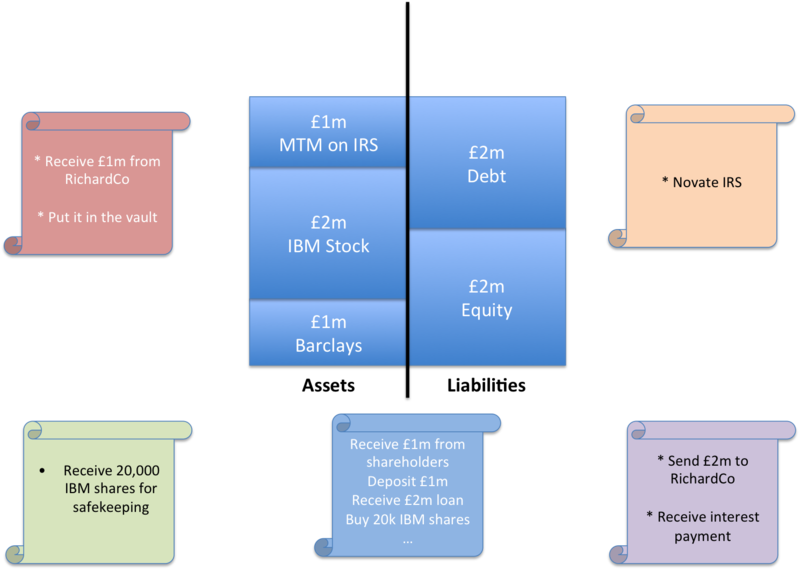 My point is that if you are inherently happy about TRANSACTIONS then the accounting and audit process becomes much more simple; no need for reconciliations or for an auditor to mess about with 3rd party confirmations (which are almost never returned!). An auditor can also gain 100% assurance into existence and completeness of transactions with counter-parties – this is the holy grail of audit. Valuation is another beast and will always require human judgement. As mentioned in the above comment, this is super useful, not only for audit. Due diligence, tax reporting, generating data for financial reporting (E.g. IFRS 15) also benefit, among other things. To me, the magic in this space is what we sometimes flippantly call triple entry (link below), which innovation is highlighted by the blockchain’s success in mounting an independent currency over a shared ledger. We all know how insubstantial internal ledger entries are, and how we can really only lean on them to the extent that we trust our internal processes (e.g. slightly germane is the events of 2007-08 leading to a popular view that accounting and audit have failed us). On the other hand, we also see how solid the payment systems are. Whether bank- or govt- or private-run, payments generally work. When these multi-party activities do not work, all hell breaks loose, and people run, sometimes quite literally, to other systems. When accounting ledgers break, we shrug. Triple entry takes us from the unreliable fantasy of the accounting entry to the hard concrete reality of the payment: the distributed ledger is as solid as a payment. This doesn’t replace double entry, nor does it replace classical payment systems. Rather it augments it by providing a way for parties to share certain transactions as if they were as solid as payments. 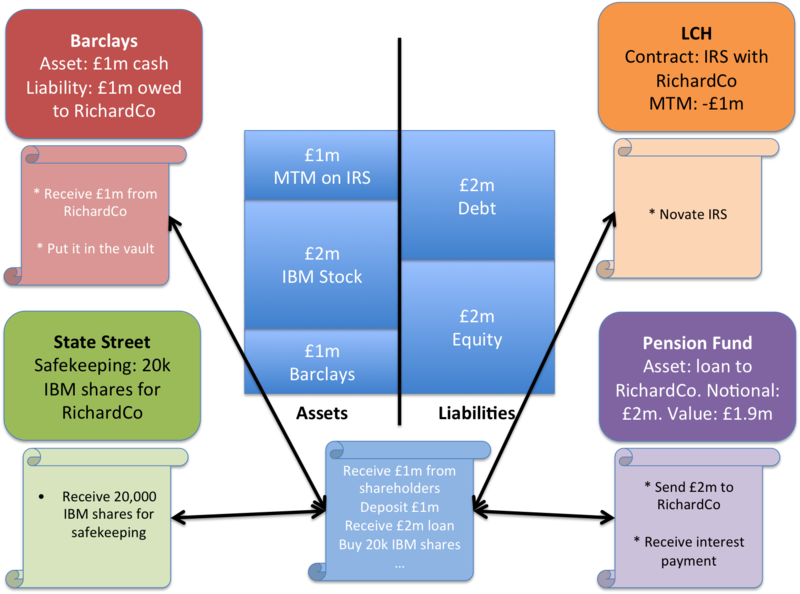 E.g., when RichardCo decides to place its capital at Barclays, it will no longer rely on its accounting systems alone to describe this situation, and neither will Barclays. Both of these parties will share a “receipt” that is cryptographically signed by some party that has mediated it (could be Barclays, could be the Bank of England, or it could be VirginMoney). That’s three parties, each holding a copy of the same receipt, hence the label triple entry. In the Bitcoin world, that middle intermediator is the blockchain, but single servers or replicated servers or small partner groups are equally applicable and in many cases better. The receipt itself is strong because it is cryptographically authorised by the payer, and cryptographically signed off by the mediator (as a minimum). It represents such high class evidence that it is practically irrefutable in terms of the facts on record, and it is trivially automatable in audit terms. 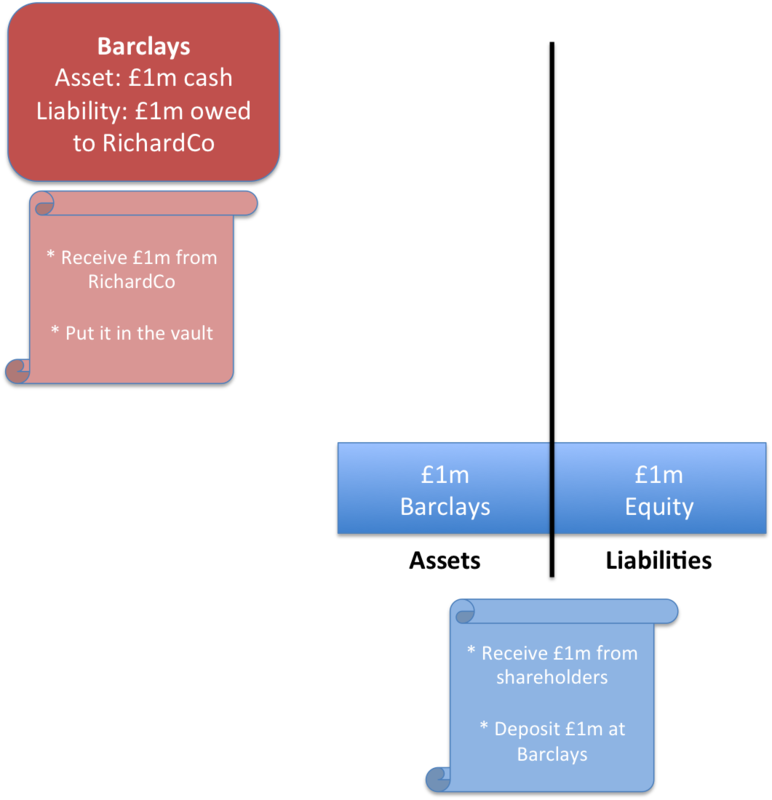 Holding this entry is far more flexible than RichardCo and Barclays relying on their double entry systems because firstly you can build the double entry systems out of the collection of receipts any time you need them, and secondly, it is so strong that it can be used as evidence to create derivative claims. E.g., it’s a set-up for securitisation or loaning or other more advanced uses. And, it’s a lot easier to audit because it is such solid evidence. Back to bitcoin and its blockchain. This is the first successful experiment in a large scale triple entry issuance. In part, seeing what happens on the blockchainn generates excitement because we perceive an ability for any company to turn its stalled internal assets into contracts that are then dynamically mediated through cryptographic receipts. Now, that contracting arrangement isn’t there yet (see for example the conceptual tussle between smart contracts and Ricardian Contracts as mechanisms of issuance) but it will get there. 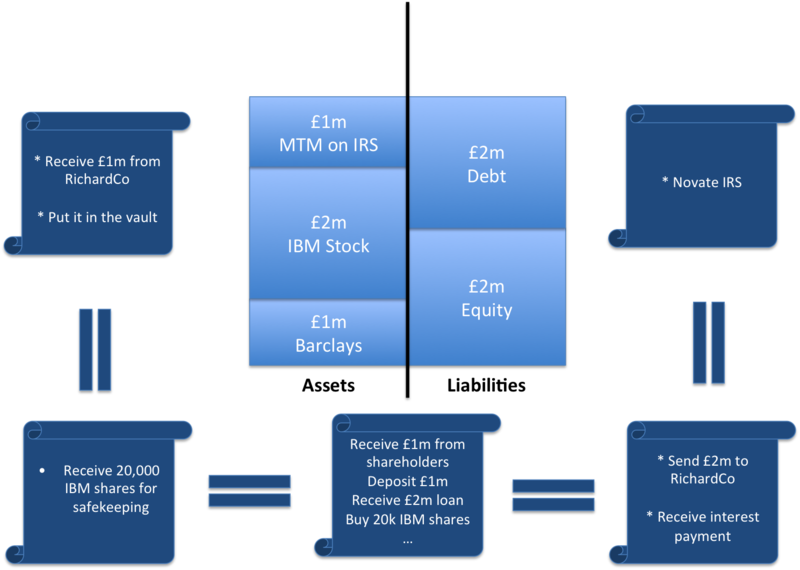 Once I can issue all my accounted assets into a triple entry arrangement that others will instantly respect, finance will democratise so fiercely that if you’re not seeing where it’s going, the shock will probably take you down. @iang – really helpful post… thank you for taking the time to spell it out so clearly. One question though: I find the term “triple entry” really confusing! In my simplistic mind, I think of “double-entry” as being all about ensuring that a *single set* of accounting records (i.e. within an organisation) are self-reconciling… every act is recorded in two places. 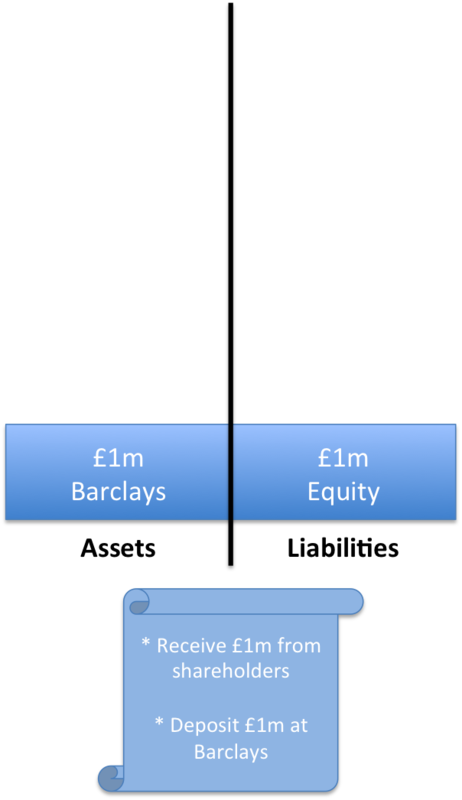 However, if I’m understanding your description of “triple-entry”, you’re talking about a different concept… about how economic activity *between* two entities can (should) be recorded by both parties (each as part of their own double-entry system – so four entries) AND by an unimpeachable third party (another entry or entries). Did I get that right? 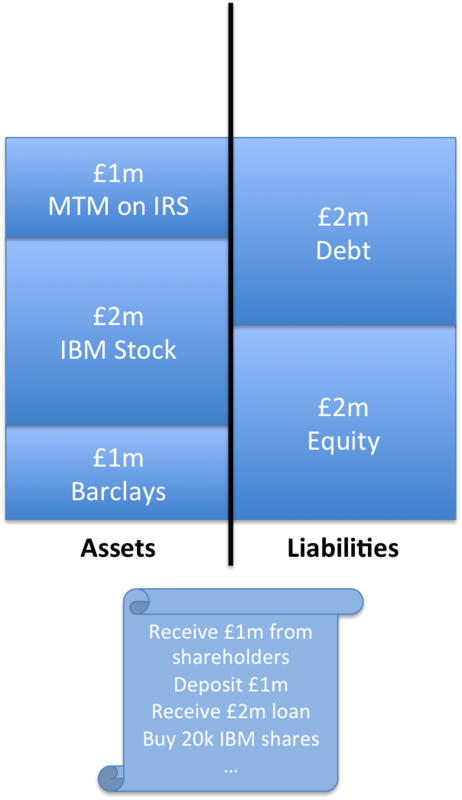 2) Valuations as subjective – I know that we have accepted this as the case but does it really have to be? Particularly if you are to develop a system which uses smart contracts (read: does not rely on people) to execute contracts and perhaps even determine a suggested valuations based on previous behavioral patterns. This would go a long way to solving the issue of trust since you are using the identity (always comes back to that!) of the user to determine the valuation on your own books – this may be more of a crypto 4.0 innovation when the systems that provide this information have already been rationalized an integrated but one can dream! Instead of this technique we use cryptographic signatures to make one entry as reliable (or more reliable) than a double entry pair. These signed entries are so strong that we can even use them as a payment token, so a payment from Alice to Bob ends up being held on Alice’s books, on Bob’s books and also on Ivan the issuer or intermediary’s books. That latter part is the blockchain in Bitcoin world, but it can be a single server. @jo – thanks for the comment. Not sure I understood your comment about trust and cost being inversely related. e.g. if we take the pure Bitcoin space, one could argue that my trust in it probably should increase in direct proportion to the amount of hashing power (=cost) being applied to it. So direct, not inverse. Am I misunderstanding you? One point thought: is it necessarily true that the cryptographically signed receipt is sufficient to recover the journal entries? e.g. a signed bitcoin transaction can be used to reconstruct a ledger entry on the sender-side that shows a reduction in the number of bitcoins being held. And it can be used to reconstruct a ledger entry on the receiver-side that shows the opposite. But it does nothing to help me construct the second entry for each of those parties… i.e. how do I reconstruct the entry showing the increase in inventory of widgets that arose as a result of paying the supplier for them? I guess the receipt *could* include that information but today’s bitcoin system doesn’t do that, right? @gendel – Certainly, in my work, there is a memo field inside the transaction which can be used to support the other ledger, but it’s never been used as such. I think a fair reason for being skeptical over full double entry recovery from the pure receipt is that there is information that isn’t knowable at the time of the receipt. That is, meta-data gets added later by end-users. Also in a published ledger such as bitcoin, it is unlikely that users will give away any information they don’t have to. But the receipt can be augmented with additional information; it is still a single entry. Whether this amounts to anything in practice will have to await large scale tests at the accounting level. It’s completely fair to be skeptical about the whole notion of triple entry. On the one hand, we’re into the information age, even the persistent peer-to-peer age. And we’ve got crypto and open networks, things which are game changers. Pure information plays like accounting should be being challenged, why so little result up until now? @iang – deal 🙂 I’ll DM you my email address….